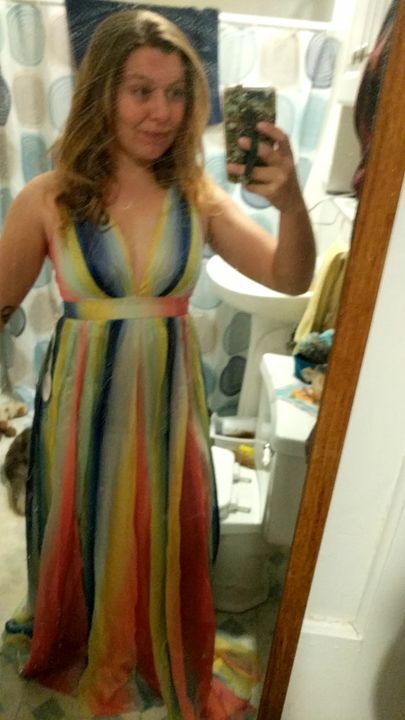 This Rainbow Maxi Dress with Criss Cross Back is so pretty! We love its bold, beautiful rainbow print, flowy skirt and criss cross back. Perfect Summer time maxi! I love this dress. It is so pretty and flowy. Exactly what I was hoping it would be. I bought it for my bachelorette party and can't wait to wear it. The only problem I have is that it is for very tall people! I am going to have to hem it to be able to wear it out. It’s a beautiful dress and exactly what I was expecting. The material is lovely and the colors are vibrant. As others have commented it is long, but I’m also only 5’1” so I usually expect to hem my maxis. Overall I’m very happy with this purchase! The fabric is of great quality and it's very well designed. Love the dress and the colors, but it is a little big and long so I have to get it altered (I bought a size small).